Hello BDTC fans! To kick off November we’re sharing two unique stories from students who went through our Teacher Training Program in 2013. Both came from out of state to take our 4-month intensive program (completing the entire 16-month training in just 4-months!). Each had her own reasons for attending and individual goals she wanted to accomplish, but they became fast friends through our program. The first is by Elizabeth Wilson from Midwest City, Oklahoma. Happy reading! 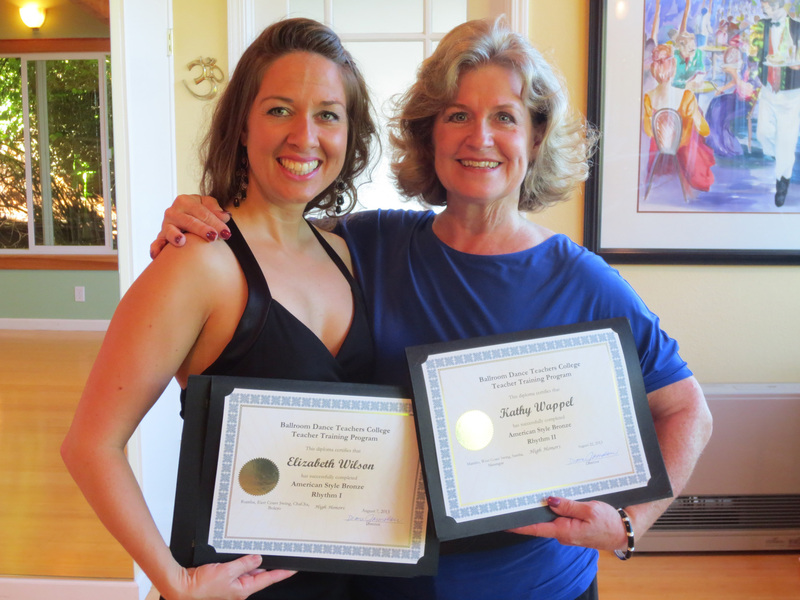 Elizabeth Wilson and ballroom training buddy, Kathy Wappel, show off their BDTC graduation certificates! About 6 years ago I decided to cross one more thing off my “Things To Do in My Life” list—ballroom dancing! After taking lessons for about a year, I ran out of money for lessons. Instead of giving up, I began dancing wherever I could find a place, mostly social parties at studios and dance clubs. One day I watched the movie “Take the Lead” and a dream/vision began to form in my mind. With a degree in youth ministry and 8 years experience, I had come to realize working with at-risk youth was as big a passion for me as ballroom dance. I wondered how I could put the two together and that movie showed me the perfect scenario: I could use ballroom dance to work with at-risk youth to create change! So I decided to train to become a ballroom dance teacher. I knew it was possible for me to stay in Oklahoma and be trained by one of the local studios. However, I also knew if I did that, I would be obligated to work for the studio. I found the Ballroom Dance Teacher College (BDTC) program being offered in Oakland, California and Vancouver, Canada. As I looked into each of the programs, I decided if I was going to go somewhere to be trained, I should go to the one where the founder was also the teacher. So Oakland it was! Deciding to pack up and leave home for 4 months was a big decision. I needed to know I had enough money, a place to stay, that my house would be taken care of, and the list goes on. Many people might have used all of these issues as a reason not go. However, after speaking to Diane Jarmolow on the phone, I had an unbelievable sense of peace and knowledge that this journey was EXACTLY what I was supposed to be doing. The first day of Teacher Training, I arrived at class to meet Kathy, who was also doing the 4-month intensive just like me. From that moment we were pretty much inseparable. We each had life lessons that the other needed to learn and hear. I can’t imagine having gone through BDTC without my buddy Kathy. The 4-month program is by no means impossible, but it’s also not easy. We had to find a system that worked for us to juggle all the dances we were learning simultaneously. Our feet, bodies, and brains hurt; we struggled with certain dance figures; we would get overwhelmed. But despite all the hardships, I can’t imagine not going through the BDTC program. The quality of instruction we received was unbelievable. Melissa and Julie (our Master Teachers) truly cared whether we were getting the figures. They want to see each of us succeed. They would recommend massage therapists, shoe stores, exercises and so much more for us to take advantage of so that we could be the best we could be! The community of students I took classes with inspired and uplifted me, and opened me to new ideas. We came from diverse backgrounds with such different reasons for pursuing this crazy passion! My dream is still the same as it was when I started BDTC: I want to use ballroom dance as the medium to create a positive change in the lives of at-risk youth. It is so exciting that my dream is coming to fruition after thinking about it for over 5 years! All in all, I can’t imagine having not attended Ballroom Dance Teachers College. It completely lived up to my expectations. I felt supported and encouraged by everyone involved. I feel deep within me that the training I received, the connections I made, and the people I met will continue to impact and influence my life, my dancing and my dreams for years to come. Feeling inspired to pursue your dreams of becoming a ballroom dance instructor? Our next Teacher Training session starts in January 2015! Find out more here.